Solar Companies Rushing the Certification Process? Mr. Kevin Emmerich of Basin and Range Watch recently noted in a comment on this blog how the California Energy Commission (CEC) appears to be bending over backward to accommodate an expedited certification process. As clarified in the comments, it appears that the energy companies (BrightSource, Solar Millennium, etc) are rushing to meet a deadline imposed in Washington mandating that projects break ground by the end of the year (2010) in order to qualify for Federal financial backing. A Leopard Lizard in the Mojave Desert, watching me carefully from the shade of a Creosote shrub. Once I got too close he/she (?) darted off and left me no chance to pursue with my camera. 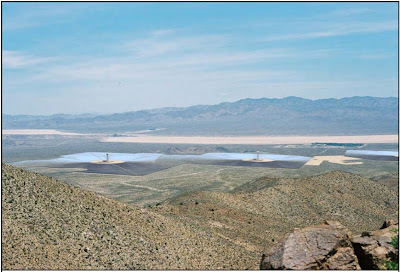 Ridgecrest Solar Site: Ivanpah of the West Mojave? Preliminary surveys of the proposed site for the Ridgecrest Solar Power Project in the western Mojave Desert indicate it is currently home to several sensitive species, even though it is not far from the outskirts of Ridgecrest. The proposed facility would disturb roughly 2,000 acres, and would be situated on a site already crossed by some dirt roads, and adjacent to Highway 395. During surveys in 2009, however, biologists spotted approximately 50 desert tortoise, including 40 in the proposed disturbance area, and four active Kit fox burrows were also found. An active burrow for an American Badger was discovered within the project buffer zone, and four primary burrows for the Western burrowing owl were found within the proposed disturbance area. The California Energy Commission (CEC) released it's Staff Assessment and Draft Environmental Impact Statement for the Stirling Energy Systems (SES) Solar Two site earlier this month. SES Solar Two -- the twin of the Calico Solar site proposed for the Mojave Desert near Pisgah--is a proposed solar plant utilizing "SunCatcher" technology on nearly 6500 acres of land in the Colorado Desert, just West of El Centro. In its assessment of biological resource, the CEC Staff indicates that it prefers a reduced site footprint in order to minimize impacts on ephemeral washes and the Flat Tailed Horned Lizard (FTHL), which is considered a special status species. 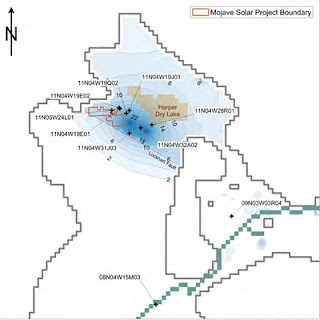 BrightSource Energy--the company seeking to build a large solar electric generating system in the Mojave's Ivanpah Valley--submitted an alternative configuration for its proposed site in an attempt to address environmental impact concerns. According to a press release on the company's website, the facility would be 12% smaller than the original proposal and would produce 392 MW of energy instead of 400 MW. The alternative configuration has not yet been posted in detail on the California Energy Commission (CEC) website, but when the details are available you can expect an updated post on this blog. San Bernardino County's Land Use Services Department and Board of Supervisors are trying to keep up with the gold rush of the century as various energy companies seek to build vast solar and wind energy projects in the Mojave Desert, the bulk of which lies within County lines. The County's priorities are predictably economic, but this has led County Supervisor Brad Mitzelfelt to speak out against the acquisition and preservation of land to off-set the loss of Desert tortoise habitat in Ivanpah, according to an article in the Press Enterprise. You can read more about the mitigation requirement on my previous post on the subject. I finally got around to reading the transcripts from the 11-12 January California Energy Commission (CEC) hearings regarding the impact of the proposed Ivanpah Solar Electric Generating System (ISEGS) on biological resources. The January hearings underscore the reluctance of Brightsource Energy--the company intending to build the nearly 4,000-acre facility in the East Mojave--to pay for the CEC's request that 8,000 acres be purchased and set aside in perpetuity for the protection of sensitive species, to include the Desert Tortoise and the Rusby's Desert Mallow. In addition to the acquisition of 8000 acres, Brightsource would also have to pay funds to help manage existing sensitive habitat on BLM land. There is a great editorial in the Hi-Desert Star by Russel Drake drawing attention to off-road vehicle (ORV) damage to a key wildlife corridor connecting the San Bernardino Mountains to the Mojave Desert. The land, known as Section 11, was set aside as off-limits to ORVs but signs had not yet been posted when the land was trampled in early December 2009. The Yucca Valley Town Council still plans to post signage prohibiting ORV use and illegal trash dumping. The land in question was identified in research used by the Morongo Basin Open Space Group to argue for its preservation. You can access some of the research on ecosystem linkages on the SC Wildlands website here. The San Bernardino County Board of Supervisors has not yet voted on whether or not to repeal current County Ordinance # 3973, which mandates that private property owners obtain a permit in order to hold large off-road vehicle (ORV) gatherings. If you are interested in voicing your opinion on this issue, you still have time to call or contact the Supervisors, and there contact info can be found at the County website. At the time of my previous post on this issue, it appeared that the Board could vote on the ordinance by the end of January. It is no longer clear when this vote will make the agenda, since it does not appear on the February 9 agenda on their website. The California Wilderness Coalition is sponsoring a workshop in Victorville on February 11th to discuss Senator Feinstein's California Desert Protection Act 2010 (CDPA 2010) and what you can do to ensure preservation of Mojave Desert wilderness. You can read my initial posts on CDPA 2010 here and here. An agenda has been announced for the April 8-11 2010 Western Wilderness Conference, to be held in Berkeley California. The conference discussions and speakers will address an array of issues regarding efforts to manage and conserve wilderness throughout the Western US, but there will be a workshop focused on the "Campaign for the California Desert: Then and Now." You can get more information on the Western Wilderness website. The California Energy Commission (CEC) indicated in early February that it sought to release it's Staff Assessment--which is usually accompanied by the draft Environmental Impact Statement (EIS)--for the Abengoa Solar project in March 2010. The Abengoa Solar project would be built north of Helendale and west of Barstow. You can read more about the Abengoa Solar project in one of my previous posts, but ultimately this project's primary vulnerability is its cooling system, which will require millions of gallons of water a year. According to the CEC, it is still waiting on more information from Abengoa Solar to complete its analysis of the soil and water impacts. The California Public Utilities Commission (CPUC) approved of Southern California Edison's (SCE) proposal to develop up to 500 megawatts of energy using distributed solar generation, which would largely consist of contracting with "Independent Power Producers" to install roof-top photovoltaic solar panels. As SCE, and possible Pacific Gas & Electric (PG&E)--which is also considering distributed solar generation--standardize the process for distributed solar generation the benefits of this model may take root and alleviate some of the pressure on the Mojave Desert. A recent study published by the US Geological Survey Fort Collins Science Center indicates that wind turbines kill certain species of bats possibly through direct impact but also because of significant changes in air pressure caused by the rotating blades. This is an additional factor that needs to be considered in when assessing the impact of wind energy projects in the Mojave, such as the Granite Mountain site near Apple Valley. Researchers are still studying what factors may be drawing the bats to wind turbines, and which species are the most vulnerable, but the study estimates that some sites may be responsible for the deaths of thousands of bats each year. An increase in wind energy farms in the Mojave could significantly impact a key pollinator and insect predator. In my post on 1 February, Phantoms of Mojave Desert Transportation Projects, I noted the relatively quiet state of two major transportation projects that would impact the Mojave Desert, to include the high speed rail line titled the "Desert Xpress". In the post, I surmised that since Federal funds were allocated for the LA-San Francisco line that may have doomed the prospects of the Desert Xpress, which would connect Victorville with Las Vegas. In the past couple of weeks developments seem to have given new life to both the Desert Xpress and a Mag-Lev train concept, despite the diversion of Federal funds to the LA-SF line. There is a lot of hype for this Spring's Mojave Desert wildflower bloom, and admittedly I feed into that hype. Being anxious to see how it turns out but unable to fast-forward time, I decided to rewind and review past blooms, although admittedly the two photos below were taken in early January 2008, so no quite spring. With all of the East Coast-centric press reporting on Punxsutawney Phil and his weather predictions, I have to give an obligatory shout-out to Mojave Max the Desert Tortoise. Actually, that's tortoises (plural) because there are two Mojave Max (talk about identity theft), one residing at Red Rock Canyon National Conservation area outside of Las Vegas and another in Palm Desert, CA. I would personally dispute the Palm Desert tortoise's claim to the Mojave title since I believe the exhibit technically falls within the Colorado Desert (as does part of Joshua Tree National Park), but that would ruin it for the kids. So let's hope that both Mojave Max in California and Nevada will enjoy a spring season with bountiful wildflowers! You can read more on Mojave Max at the Desert Tortoise Recovery Office website. I found reference to an interesting documentary that is scheduled to air in Utah on KUED called "Wilderness: The Great Debate" looking at the same sort of questions that are coming up in current Mojave Desert land use discussions. The documentary examines wilderness policy in Utah and attempts to capture the views of various stakeholders, to include ORV riders, conservationists, locally elected officials and Secretary of the Interior Ken Salazar. The synopsis is available on KUED's website, but if anyone knows if it will air elsewhere please let me know.